There is no real reason to describe what makes Jaws so good. And not to mention the amount of history it left behind. This came out in 1975 when the term “blockbuster” started to mean something and launched the career of director Steven Spielberg. Based on the novel by Peter Benchley, it took a simple concept and ran with it. In fact, it almost feels like two movies in one; a basic slasher and a fishing movie. Man vs. nature while we question if this is a basic act of nature or just an normal occurrence over exposed. The story is a very simple one and not too hard to follow. A small town named Amity Beach is prepping for a big 4th of July celebration when a shark attack changes all that. At first, the mayor (Murray Hamilton) tries to cover it up but sadly it fails seeing more attacks occur. Things get heated to the point someone has to stop the shark and it get left in the hands of Chief Martin Brody (Roy Scheider). Thankfully, he isn’t alone as by his side are the quirky oceanographer Matt Hooper (Richard Dreyfuss) and the spiritual yet sinister Captain Quint (Robert Shaw). From the scene when the first shark attack happens, it has you hooked. The idea of something simple as anything happening in the big ocean reaches a connection. We all love to visit the ocean and yet we fear it. Jaws plays on these two consciousness knowing that an attack from a big fish couldn’t be possible but yet opens that possibility. This is mostly because a lot of the time you never see the shark. A clever idea and came from an accident when the mechanical shark puppet wouldn’t work. It resorted to Spielberg using point-of-view shots and music to give a basic cue to audience when the shark appears. It works because it allows the imagination of the viewer to play out as terror from the deep surfaces on the swimmers for lunch. And when we do see the shark, its satisfying. Again, we don’t see much and I feel that is a huge strength for the movie. Once Brody and the gang are out on the ocean, anything goes in the world of the shark. Knowing how powerful this beast can be, we wonder just how well this thing could be stopped while each of the shark hunting trio take turns in trying to use their expertise to destroy the water beast. It’s this section of the film that really gets engaging. After teasing and showing how destructive this sea monster can be, we let our heroes come in and save the day. Jaws also has a great cast too with so many great performances that are too much to mention. 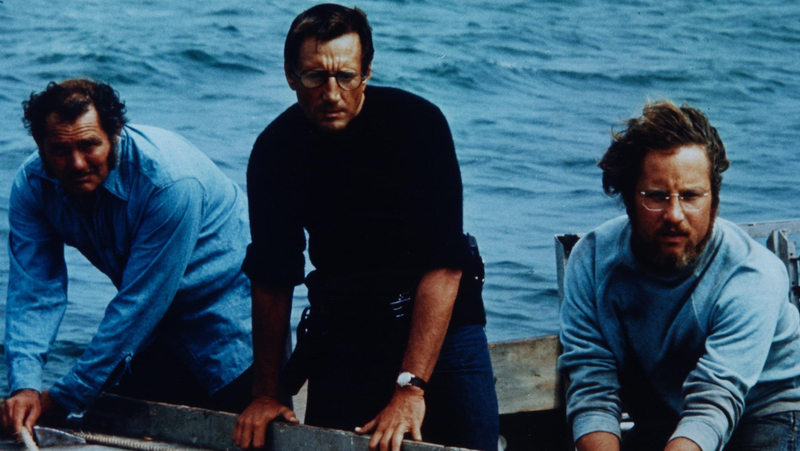 Roy Scheider is great as the every man hero Brody as we connect with his family life and ethics. He fears for the safety of the people while trying to question his ethics. This comes into play later when he is at sea and tries to fit in with Quint and Hooper. At first, he tries to be rational despite having his ideas ignored. Without giving too much away, it appears the pay off at the end is that any given person will come forth with a simple solution that might work. And in some cases, it doesn’t take a rocket scientist to know how deadly a shark can be. I also love how Robert Shaw and Richard Dreyfuss play off each other as Hooper and Quint. It feels like student vs. mentor but not in a cliched way. Hooper at first appears to be cocky and really plays up the comic relief. 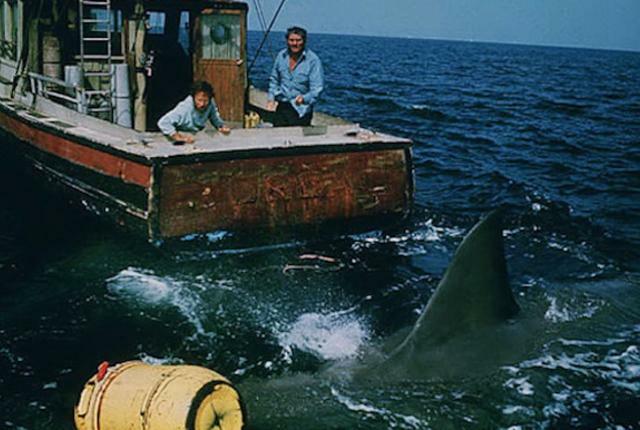 But during his stay at Amity Beach and in the final moments, he proves to be a reliable source seeing his knowledge of sharks comes into play at the right time. Quint, on the other hand, believes that science needs to take a back seat considering his view of ocean life and seeing it his way. He almost has a spiritual sense to it even when he recounts his time on the Indianapolis. A scene that will go down as one of the best in cinema history hearing Quint’s horrifying tale of the secret mission gone wrong. Jaws as a whole feels like two movies in one. We get the typical slasher film as the shark stalks and kills its victims while the final half plays off like a fishing trip gone wrong. Your so embedded into these characters that you want to see them put an end to the terror of the sea and beaches. 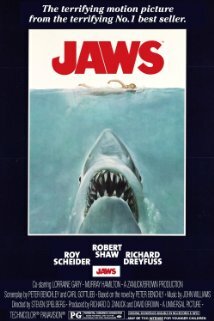 For as long as this movie has been around, surprisingly it does manage to scare people away from swimming in the ocean. And its not hard to see why considering something simple as the open sea can be a deadly creature to deal with. I also have full bragging rights to say I was able to see this on a drive-in theater screen this summer and can say this movie still packs punch, laughs and thrills. The experience alone of seeing a classic on a nostalgic favorite screen is enough for me to give this a high recommendation and remind viewers that even the most basic concept can make for an effective and unique motion picture. 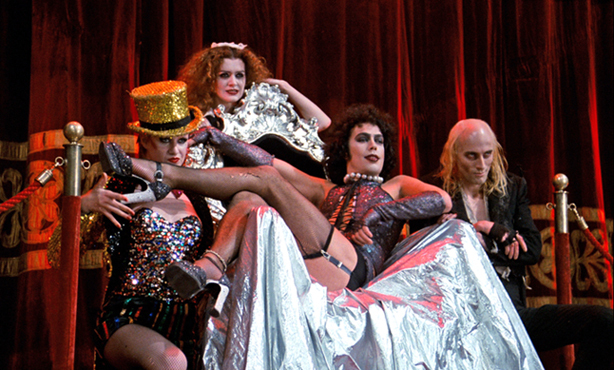 What is Halloween without The Rocky Horror Picture Show? An iconic horror musical that pays homage to the cheese B-movies of the 1950s while being a twisted look into the dangers of sexual desires. Its a strange mix but yet it works. There’s just something charming yet entertaining to its weirdness. And it may start to sound like I have mixed feelings but I really love this movie. The problem is that its a hard film to talk about considering there is so much to describe and discuss. Even my own blog post can’t do much justice seeing how big of a cult phenomenon this movie is. Its become a huge staple for midnight movie screenings where actors would dress up as the characters, shout back at the screen, dace to the Time Warp and even throw things around like toilet paper or cards. So how did this magnum opus written by Richard O’Brien get so big? Well, I’ll do my best to say how and why its such a famous crowd pleaser and a favorite movie musical of mine. 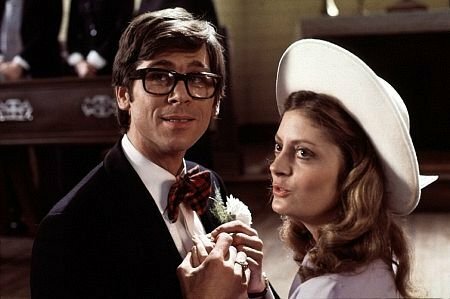 Barry Bostwick and Susan Sarandon are two teenagers turned fiances named Brad Majors (a$$hole) and Janet Weiss ($lut…I couldn’t resist) who love each other so much they plan to get married down the road. When attempting to visit an old colleague of theirs at night, they unfortunately get a flat tire and seek assistance from a spooky house not too far down the road. As it turns out, the house is full of strange people that are really aliens from the Planet Transsexual in the galaxy of Transylvania ( I know its weird on paper but just go with it). From then on, it becomes a hilarious send up and homage of cliches to horror films of the 1950s. Richard O’Brien is a creepy butler named Riff Raff, Patricia Quinn is a sultry maid named Magenta who is Riff Raff’s sister that talks in cryptic dialogue most of the time and Nell Campbell as Columbia who is ambiguously human seeing her character is labeled in the opening credits as a groupie. Its an interesting mesh of classic tropes from haunted house movies or even “whodunnit” mysteries. But all that changes when Tim Curry literally drops in by means of an elevator shaft and this is when things really kick off. Tim plays a character with the archetype of a mad scientist named Dr. Frank N. Furter and is also a proclaimed “sweet transvestite from Transsexual, Transylvania.” Every scene he is in, you can’t take your eyes off him. 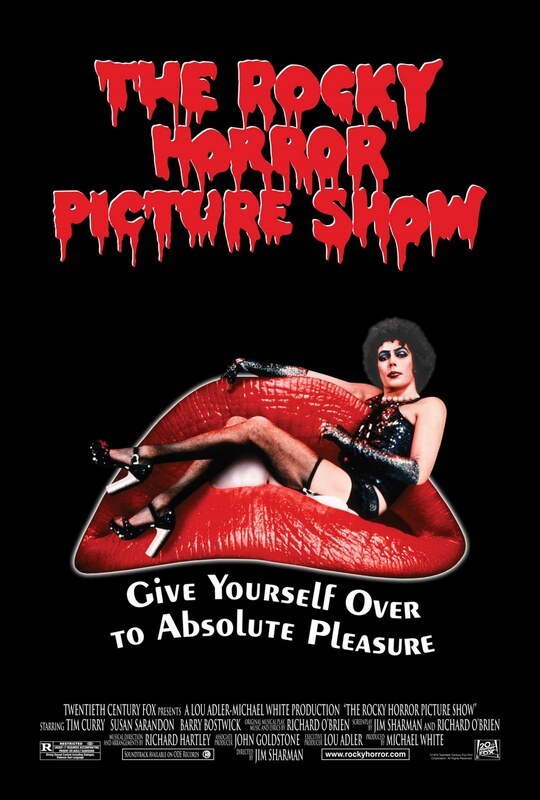 Tim Curry gives it his all performance wise and singing wise. In his first number, you don’t know what to expect from him. He’s dancing around in a corset and fish-stockings while making subtle gestures to our heroes that their night has just begun and won’t be the same. It is truly a game changer I’m sure first time viewers will have no idea what to make of such a strange sight but yet press on further. Basically, Dr. Frank N. Furter plans to bring a Frankenstein-like monster to life when its revealed that its a blond, tan and muscular man played by Peter Hinwood in his first and only film role. Again, it brings about a huge switch from the normal tropes of the classic monster movies and plays it up for laughs. What I like is the build up where its played out serious when Frank and company are turning on machines and really playing out like a Universal Monster movie. But when its revealed that the monster in question is just a hunk, we can’t help but laugh at the expectations knowing what its parodying. The Floor Show…need I say more? And from here, I can’t talk about the story any further or it would I would be ruining a lot for new first timers. To describe the second half of the movie, it gets more and more bonkers as it goes along. We go from an old lab experiment played by Meat Loaf to a German scientist in search of his lost son to even a grand floor show unlike anything you have ever seen. This is truly a love letter to the monster movies of the past while spoofing them along the way or adding some adult twists to them. In a nutshell, its a really different flick that is memorable for how other worldly it gets from start to finish. 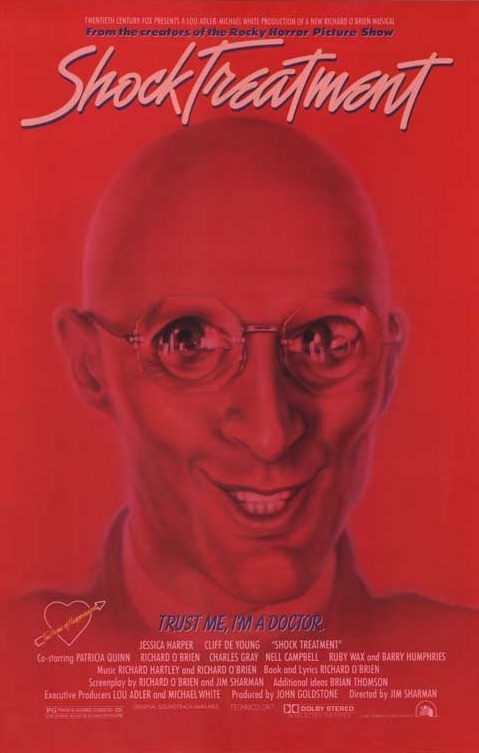 Richard O’Brien once said that going to see a movie for the first time in theaters is almost like your virginity. We don’t know what to expect from a feature we have yet to see and wonder how it will play off of us or will it entertain in the end. That is very much what The Rocky Horror Picture Show is. There’s so many odd and unpredictable things that you really don’t know what to expect in the end. I’d go into deeper detail about why the songs are so good or my favorite moments but seeing the movie still plays in theaters I’d best recommend to see it there when you get the chance. But if you want to be lazy, it is available on DVD and Blu-Ray. But I must add that you will never experience the full power of Rocky Horror unless you have seen it in theaters to which it still plays at to this day. Its a sequel…or is it? There will never be another like it nor will there be. However, there does exist a supposed sequel called Shock Treatment. I should address that the release of Rocky Horror was not a big success but it got better when it ran in midnight movie screenings. Hence why it has never been pulled by 20th Century Fox and continues to play in theaters. To think a sequel to one of the greatest and legendary horror musicals ever made would be possible and it did have potential. 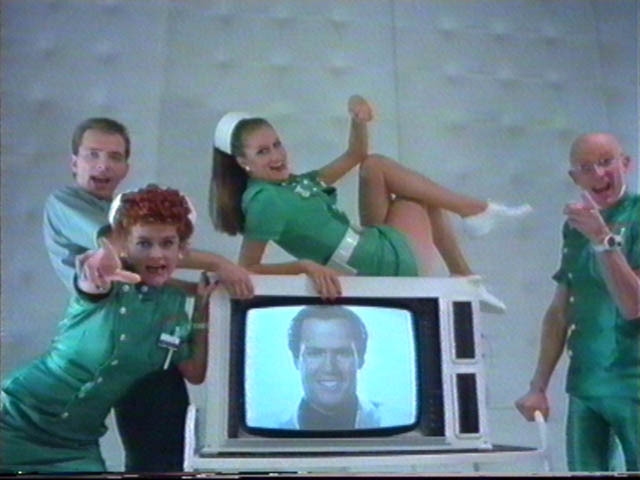 Due to a writer’s guild strike, Shock Treatment went under many budget cuts to the point it was mainly shot on sound stages for reasons I’ll talk about shortly. 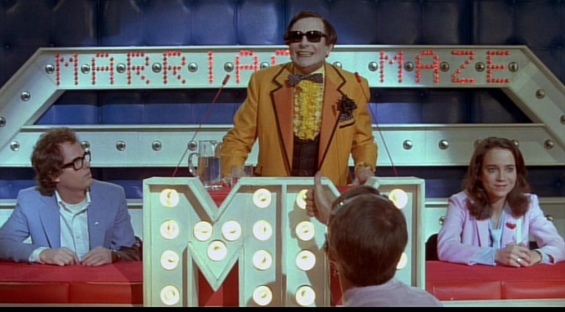 It was released on Halloween of 1981 and despite the hype surrounding it, Shock Treatment flopped. The main reason is because 20th Century Fox only released it as a midnight movie thinking it would garner the same success as Rocky Horror this way. It never got a first run release or even giving a nationwide debut. Since then, it has been rediscovered by many fans and even given it the same treatment as Rocky Horror with it being a midnight movie though not as widespread and big. Many critics of today view it as being underrated. But unfortunately, I find it to be somewhat underwhelming. 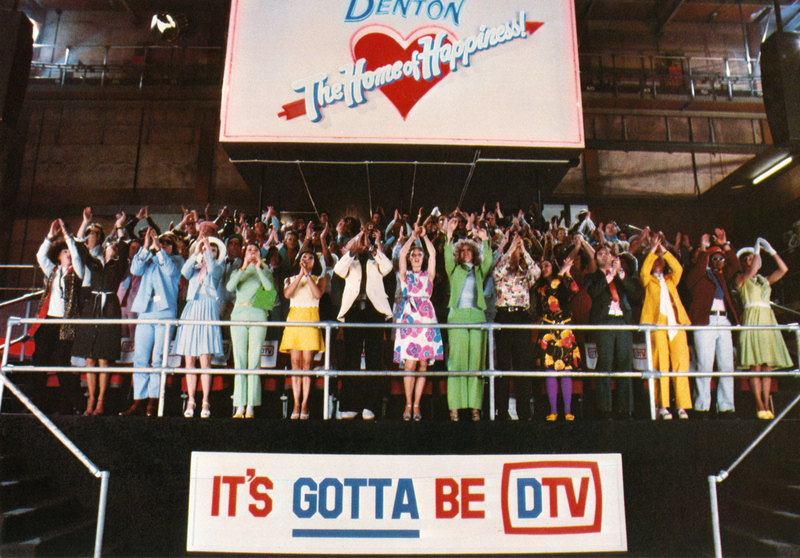 The story did have promise as Denton is converted into a massive TV station where the citizens are reality show junkies. This is a really interesting commentary that had a lot of potential exploring the fascination behind the obsession for game shows or real life soap operas. But it doesn’t full pay off and the conclusion they use is very weak. Brad and Janet return but this time played by Cliff DeYoung and Jessica Harper. They are no Susan Surandon or Barry Bostwick but they really try. This time, Brad and Janet’s marriage is on the rocks for unexplained reasons as they go on a game show to coupe with their problems. Brad is placed in a ward and deemed criminally insane while the TV station’s founder sets Janet on an ego trip as a famous rock star. I will admit, this is a promise idea but not much potential lives up to it. I like how Janet goes all out and it really fits with her character to see her go through this ultimate transformation but it doesn’t pay off as much. I think this is because all Brad does is just sit around in a straight jacket for the most of the movie instead of giving something to do. Why not have him set up as a news anchor for gossip or even play with his ego more by having him as a soap opera star? I understand the villain is trying to tear them apart but why not play around with it further? The world of Denton gone TV obsessed! That is very much my main issue with Shock Treatment. It doesn’t do much the characters aside from Janet’s storyline which even then never gets a good payoff. In the original Rocky Horror, both characters were given more things to do where else here there’s not much done to explore them more both or even challenge. The only good things I can say is that SOME of the original cast members do return but as different people. Richard O’Brien, Patricia Quinn and Nell Campbell return as doctors and nurses while Charles Gray (who played the Criminologist in Rocky Horror that acted as a narrator) is now a canned news anchor that feels something is off with Denton. I should also point out fans of Rik Mayall might be interested to know that this movie held one of his first film roles. He plays a character a character named “Rest Home” Ricky who very much takes random photographs and at one point gets to “sleep” with Nell Campbell’s character. Its a very small role but yet something about it feels memorable. He has little lines, its a very quiet character and vastly different from the loud and out of control humor he would later do for The Young Ones or Bottom. 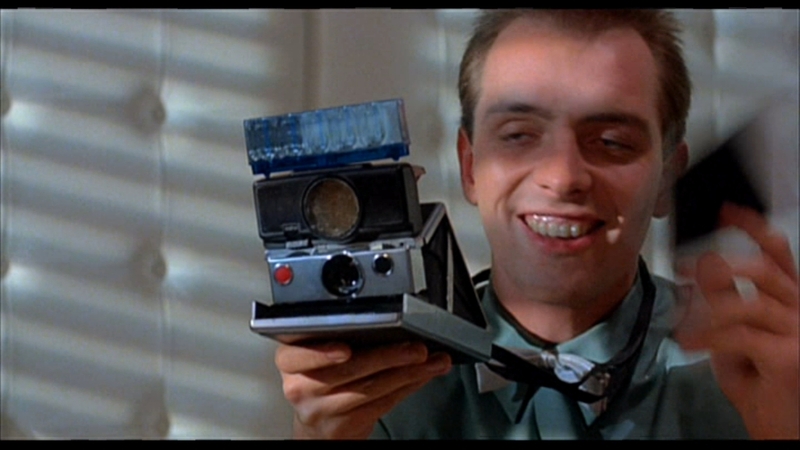 Even watching it now, its strange to say I didn’t think Rik was ever in this movie and it feels weird to say just how a performance like this can show that he had variety to his acting methods.